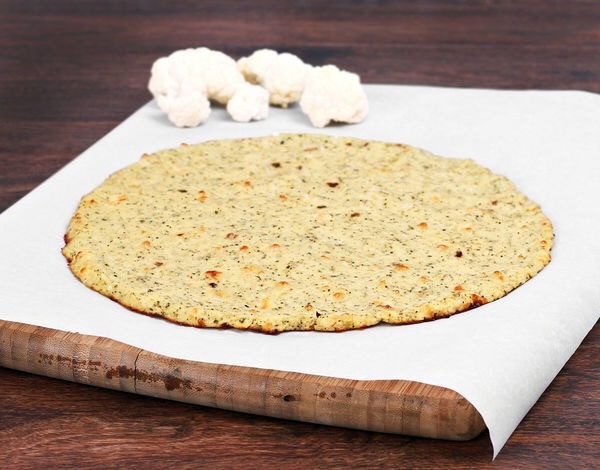 Cauliflower Pizza Crust – This Girl Loves to Eat! Pizza is my weakness anytime I’m trying to lean out. The ooey, gooey, cheesy goodness just warms my insides at the mere mention. But I know it also will leave me bloated and sorry I gave in to my craving afterward. This crust, from Eat. Drink. Smile. solves that problem! To rice the cauliflower, cut florets into chunks and pulse in a food processor until you see rice-like bits. You could also use a cheese grater to produce the tiny pieces. Do not over process, you don’t want mush. Microwave the riced cauliflower in a bowl for 5-8 minutes depending on your microwave. No need to add water. After microwaving, transfer riced cauliflower to a fine mesh strainer and drain completely, gently pressing out excess water. Once drained, transfer riced cauliflower to a clean dish towel and wrap the sides around the cauliflower while gently pressing out excess water. This drying process is important! One large head of cauliflower will yield about 3 cups of riced cauliflower. Use it to make more pizzas immediately, or store in the refrigerator for 2-3 days. Bake your dough at 450 degrees for 15 minutes. Remove from oven. Add sauce, mozzarella cheese, and your favorite pre-cooked toppings to your pizza. Place pizza under broiler just until cheese is melted, be sure to keep an eye on it! Posted on January 19, 2017 by ls1228Posted in Baking, Breads, comfort food, Dieting, Dinner, Fruits & Vegetables, Gluten Free, Good For You, Low Carb, Main Dish, Meatless Monday, Recipes, Skinny, Tips & TricksTagged cauliflower, cauliflower pizza crust, Eat. Drink. Smile., pizza.